We have Gulf Shores beach vacation homes! We think houses are the BEST kind of vacation rentals in Gulf Shores. 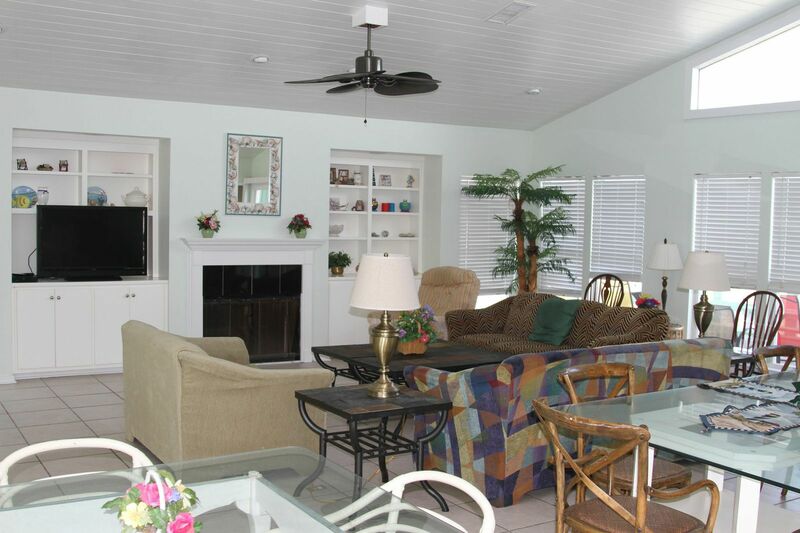 Why stay in a home when you need a vacation rental in Gulf Shores? Very comfortable, relaxing, 5BR, 4.5BA right on the water. Accommodates up to 16. No shared hallways. Generally no shared walls, with the exception of some very nice duplexes! It’s your vacation home. Your living room. Your bathrooms. Your kitchen. Make one of our vacation homes your home for your next vacation! Vacation houses are better than other types of vacation rentals because they are houses! That’s a bit circular, we know, but what does a house have? Kitchens. Baths. Living rooms. Other bonus areas. Bedrooms, and lots of them! And amenities! Washers and dryers! Not one’s you share (and have to bring quarters for) but your OWN washer and dryer, often two (or three!) of them. How about fridges and dishwashers? Of course! And, most of our units have TWO refrigerators and TWO dishwashers. See if you find that in any other type of Gulf Shores vacation rentals. Definitely not in hotels or many, if any, condos. Why would you want two fridges and dishwashers? If you don’t know, just wait until you try it! Our vacation houses just have lots of extras. Some of them you’ll think of as extravagances, like the double dishwashers!, but once you’ve had them, you will wonder how you ever got by without them! Space. Space. Space. Vacation need space and our Gulf Shores vacation rentals have it! Houses. Big. Lots of Space. Kids take up space. Golf friends take up space. Luggage takes up space. Friends take up space. You want large rooms, extra rooms, closets, space. Why would you want to stay in cramped Gulf Shores vacation rentals of any other type? Spread out. Stay in one of our spacious vacation homes! You absolutely will not regret it! Homes as vacation rentals can actually cost less! First, a family of 5. Let’s say you get a cheap(ish) room at a hotel, say about $200/night (good luck with that! ), and you stay 6 nights. That’s $1200. But that’s a cramped single hotel, usually with no kitchen, no extra rooms, one bath, and so on, but okay, that’s your call. Now, let’s say you want a little more room. Sounds good, you get adjoining rooms. So, now you’ve doubled the cost, say $2400, and you still don’t have all the amenities of home. Look, we’ve done this because we have to, we have 3 kids, 13, 12, and 8, and they just don’t fit in a hotel room or even a single bedroom condo… but if we have the time to find a house whereever we are going, we definitely do that instead. Its just a much more comfortable experience! For less than $2400, you can stay at one of our places, like On Golden Pond #3, a nice 3 bedroom with community pool, covered dock, and a lot more. ANY GROUP bigger than 5! More people = more savings! If you are a bigger group, or aren’t one family, then a house is really the only way to go! A group of 10 golfing buddies? You can save HUGE on your Gulf Shores vacation rental by staying in a house. Say stay in Andrew’s Sandbox, with 6 bedrooms, sleeping up to 22 people, and I am sure you and your pals can all find a comfortable bed to yourself! Of course you want a house! Shared kitchen? Check. Multiple baths? Check. Washer/Dryer, fridges, dishwashers. Check, and usually more than 1 of each! We took a trip with 3 families (4 total) and stayed in Casa Playa with 8 adults and 10 kids, and it was perfect! We all came together for meals, but we had the space to spread out when folks needed a break! On another trip, 5 families, with a total of 10 adults and 16 kids (literally aged from 6 to 17, with several multiples), stayed together and we had a fabulous time. Lots of room around the living rooms. Kids would disappear to the beach or hand in the second living room while the adults chilled in the main living area as well as on the large back porch. Sunset? Check. Peace, love, and understanding? Check. Rumble of ocean? Check. Rumble of children packed too tightly into a small vacation condo or hotel? NO WAY! Vacation rental houses have more personality! Staying in a house as your choice for your next Gulf Shores vacation rental means living in a unique space. Every home is different. Each our our vacation homes has a different layout. Some are single level floor plans and others have three levels! Some have elevators. Some have covered or uncovered or community pools. All have lots of unique furniture and decorating details. You walk into your weekly–or monthy–vacation rental with us, and you walk into not just a house, and so much more than a hotel or condo, is a vacation home! We like our beach homes for our vacations. Give us a call and we’ll help figure out which of our houses will be the perfect home for your next Gulf Shores vacation rental.